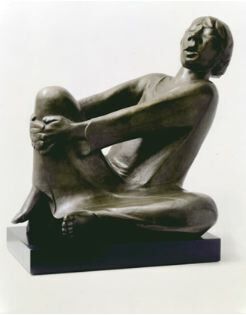 Ernst Barlach, a predecessor, as well as, a contemporary of the German Expressionists is difficult to classify. Since he worked chiefly in the mediums of printmaking and sculpture, he did not achieve the widespread recognition of painters such as Kandinsky or Kirchner. Nevertheless, due to his multitude of talents, Barlach was an extremely influential artist. Like many in the Expressionist movement, he was interested in creating "total artworks" that united disciplines to explore the human condition from various perspectives. He was also a writer who produced a number of print portfolios illustrating literary works by himself and others. This artist pioneered the woodcut revival that was to have a profound impact on his slightly younger Expressionist colleagues, as well as on Käthe Kollwitz. Born in Wedel, Barlach was both an artist and a dramatist. He took up the formal study of art in Hamburg in 1888, and also received training in Paris, Dresden and Berlin. His earliest works were influenced by Art Nouveau; however, a 1906 trip to Russia helped him towards Expressionism. Hereafter, he often depicted Russian beggars and farmers, symbolizing the difficulty of human existence. In 1907, Barlach signed a contract with Galerie Cassirer in Berlin and, in 1912, a group of twenty of his woodcuts was shown there. That same year his first play was published. Though Barlach initially supported Germany's position during World War I and served two months in the infantry, he returned home to create memorial sculptures and prints imbued with anti-war sentiment. During the Weimar period, Barlach's work was well received by the German public. In 1930, he was given a retrospective at the Prussian Academy of Art and participated in the Venice Biennale. Despite the fact he was basically apolitical, Barlach suffered under National Socialism. He was denounced for his negative images of the human condition and accused of being "alien" and "Eastern;" rumors abounded that he was Jewish. In 1932, thugs broke his windows. By 1933, Barlach's mail was censored forcing him to give up the home he built. Between 1935 and 1936, his works had been removed from the major German museums and he was forbidden to exhibit. Nonetheless, Barlach remained in Germany. His pacifist themes and depictions of people assumed to be of an inferior race were included in the "Degenerate Art" exhibition of 1937. Soon thereafter, Barlach fell ill, dying a year later in October 1938.